The city's move to create a designation in its zoning code for blood plasma collection centers was a big topic this month -- so much so that we wrote a whole separate post about the issue. There has been drama. Reps from Madison Park Management were at the meeting to rep the development company RECKDE, LLC and pitch the case during a public hearing for the planning board to approve a conditional use permit allowing a single-family home at 35 Glenwood Street to be used as a two-family. Specifically, the permit would allow a basement apartment. But there was a catch: That basement apartment already exists, and apparently had been created without approval from the city. The management team said that happened under a previous management regime (which was fired), and the owner was trying to get the property on the books legally so it could be sold. Chair Al DeSalvo said the board had "significant concerns" about the request, and said the various entities involved should have known better. He said he had taken some measurements of the property and reported that its square footage -- what he figured to be 1381 square feet -- fell short of the 1,600-foot cut-off for dividing a single-family property. Four nearby residents spoke against the permit during the public comment period, citing concerns about the size of the home, noise, and parking. And Common Council member Judy Doesschate also was critical of it, noting it didn't meeting the square footage threshold and she argued the split wouldn't be a benefit to the neighborhood. "We don't really want small houses being carved up because we recognize that will have a detrimental effect on the area," she said. When it came to vote, DeSalvo said he was concerned other similar small homes could end up being subject to being broken up and he reiterated that the property just didn't meet the square footage threshold. Board member Christopher Ellis also said he was uncomfortable with the permit. And the board issued the rare down vote for a project -- 5-0 -- against the request for a permit. 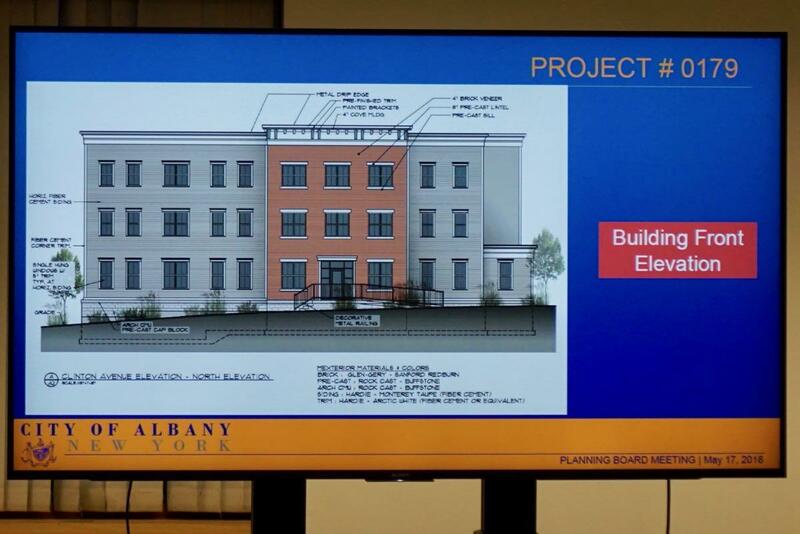 The public hearing portion of the meeting continued with a request from Thomas Lacy for a conditional use permit to convert a two-family townhouse at 43 First Street in Arbor Hill into a three-family. Lacy was represented by James Bolden, who told the board the neighborhood is changing. He said that was not necessarily a bad thing, but it was becoming less affordable. He said the additional unit would create an affordable apartment. The board voted to approve the permit 5-0 -- with the condition that there was a clarification and confirmation about the story height. And the last item in the public hearing portion of the meeting: A proposal to use a portion of a building on a parcel at 160 Central Ave as the new home for the Castle Island Bilingual Montessori made its first appearance before the board. The school's founder and direction, Diane Nickerson, walked through the plan to use the Sunday school annex of the former St. John's Evangelical Lutheran Church for Castle Island. That portion of the building is actually on Bradford Street (street view above), and sits behind a space used by the new Capital District Latinos community center. Nickerson said they'd be using the classrooms and associated spaces on two floors, and the school would be separated from the adjoining building by locked doors. Students would play in an adjacent courtyard. And she said they were hoping to get loading zone designations by the entrance on Bradford for morning student drop-offs and afternoon pick-ups. Castle Island, a non-profit school for ages 3-12, is currently in a space at 10 N. Main. (And you might remember it was once hoping to occupy 10 Thurlow Terrace.) Nickerson said the move to the new location would allow the school to grow from its current 33 students to 55. There was one public commenter: Kathy Jones, who lives nearby on Bradford Street. She said parking and traffic on the street were already a problem, and she was worried about the effect from additional traffic related to the school. She said neighbors are concerned. The board did not vote because it hadn't received an opinion from the county planning board yet. (A requirement because of the proximity to Central Ave.) And it's waiting for input from city traffic engineering. 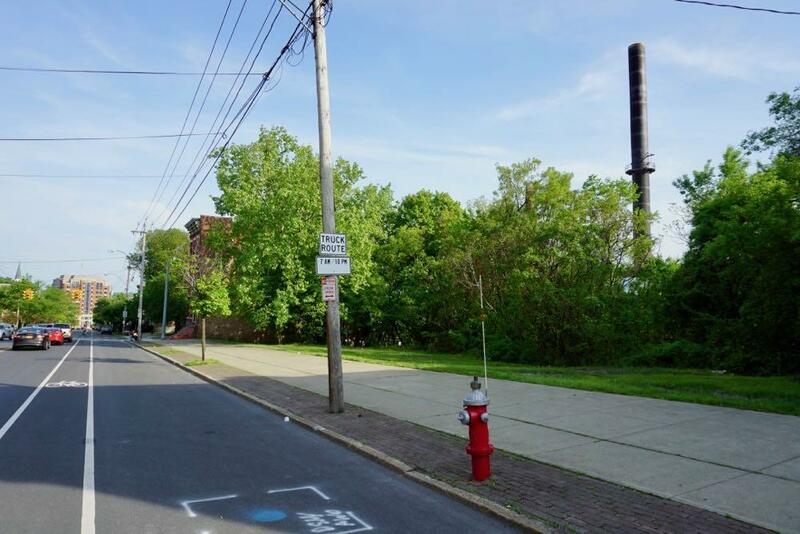 The plan from Rehabilitation Support Services to build a three-story, 20-unit apartment building on a series of vacant lots starting at 104 Clinton Ave (near Hawk Street) in Arbor Hill/Sheridan Hollow was back up for the second consecutive month. The attorney for the project had tried to push it through last month during its first appearance (because of a grant application deadline), which would have been very unusual. Dan Hershberg -- of the engineering firm Hershberg & Hershberg -- did his thing, recapping the project and its plan for stormwater and sewer. And there wasn't much discussion from the board about the project design. But the exact nature of the project has been a little undefined. RSS has pitched the project as affordable housing, and after last month's meeting officials said it would include supportive housing. Board member Glinessa Gaillard lives near the site and recused abstained from voting. (She was not required to do so, but as she explained last month she felt that was the fair and prudent thing to do.) But she did ask a series of questions with an eye toward getting a fuller picture of how the project would be used. RSS managing director John Paduano explained that 10 of the units would be set aside for people who need some sort of support with things like budgeting or grocery shopping. The other 10 would be set aside for people with incomes at 50 percent of the area median or below. And he said that there will be staff on site during normal business hours. Gaillard also took the opportunity to lean on RSS a bit about the exterior condition of the adjacent building it owns. RSS officials said they don't operate the property, but they acknowledged its exterior could use work and said they were seeking funding to make repairs. The board voted 4-0 in favor of major development plan approval. The Kipp Tech Valley Charter School's proposal to build a school expansion -- and knock down some vacant building for the expansion of a parking lot -- was back up before the board. The project had been up multiple times before. Dan Hershberg did a project recap, noting a few small changes. Among them: a playground won't be built along with the expansion. Hershberg said the plan was still to build the sidewalk over to the playground spot, and to clear the space, but the school just didn't have the funding for the playground at the moment. Brad Glass -- the city's planning director -- also noted what appeared to be another new change to the plan: a second driveway on the south side of the project site. Hershberg said that would be an entry for buses. Glass said the city would need traffic engineering to sign off on the driveway. The board voted 5-0 in favor of both a conditional use permit and major development plan approval for the project, contingent on a traffic engineering review of the driveway. 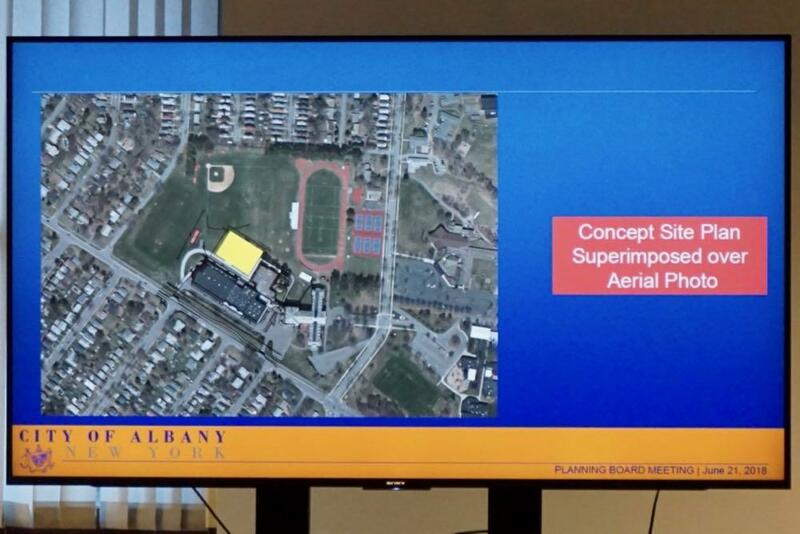 The last item was up for the first time: The Albany Academy is proposing to build a new gym on its campus. The gym would sit just to the north of the school's field house (which in turn sits just the north of Hackett Boulevard). Dan Hershberg explained that the 31,000-square-foot gym would largely not be visible from outside the campus and would have no space for spectators. He said the motivation for the new gym was to provide extra after-school practice space for student teams. The hope is to have it open for the 2019-2020 school year. This was the project's first time up, a concept review. And there was little discussion from the board. I think you mean "abstained" from a vote. Proper recusal would be removing oneself from the case entirely (not being part of questions or discussions with the applicant. @Anonymous: You're correct. That is the word I should have used. Thank you. 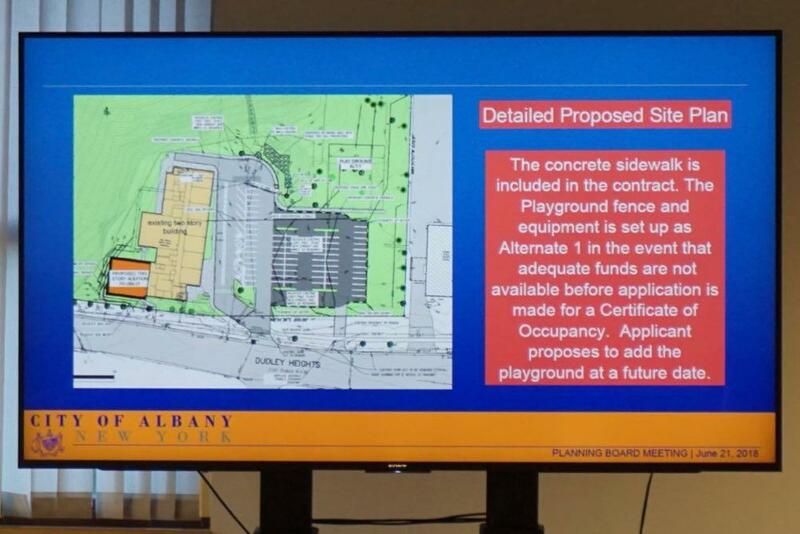 The Albany Planning Board -- AKA The Dan Hershberg Show! There's a typo: "She neighbors are concerned." @Reader: Thanks for the typo heads up. It's been fixed (along with a few others). And, yes, Mr. Hershberg is a recurring star of this show. Maybe it's time for an AOA profile of Mr. Hershberg?